Following the weakening of the Byzantine Empire , the Venetians captured the island of Kos to 1306. In 1315, they sold the island to the Knights Hospitallers of St. John . Until 1336, the island was still disputed between the Byzantine Empire, the Venetians and the Knights of St. John. After this date, the Knights firmly contrôlèrent the island of Kos. 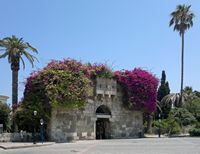 The medieval town of Kos, fortified by the Knights Hospitaller, occupied the zone today between the Boulevard des Palmiers (Λεωφόρος των Φοινίκων) and Boulevard Hippocrates (Λεωφόρος Ιπποκράτους) it encompassed less than a quarter of the ancient city Greco -Roman , ie only the port area and the ancient agora, later known as Chora district. The heart of Chora was the Piazza della Loggia is now Sycamore Square. 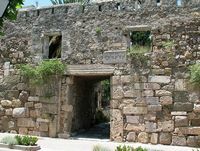 Adjacent to the castle Neratzia was a small town whose fortifications began even before the construction of the fortress. It is under the magisterium of John Fernandez de Heredia (1376-1396) a low wall height, surrounded by a shallow ditch, was built from 1391 to 1396. This fortification was to defend the city against medieval attacks the Turks Sultan Bajazet I..
All that remains of this fortified two of the five doors, the South Gate and door known as the "Tax Gate," two towers (angles to the southeast and southwest of the town) and small section of the wall (below the Plane-tree Place of Hippocrates). The Tax Gate (Πύλη του Φόρου), the southwest corner, was so named because the merchants in the Middle Ages, were to pay tax for selling goods in the medieval city. Porta Fórou still is today covered with beautiful bougainvillea. 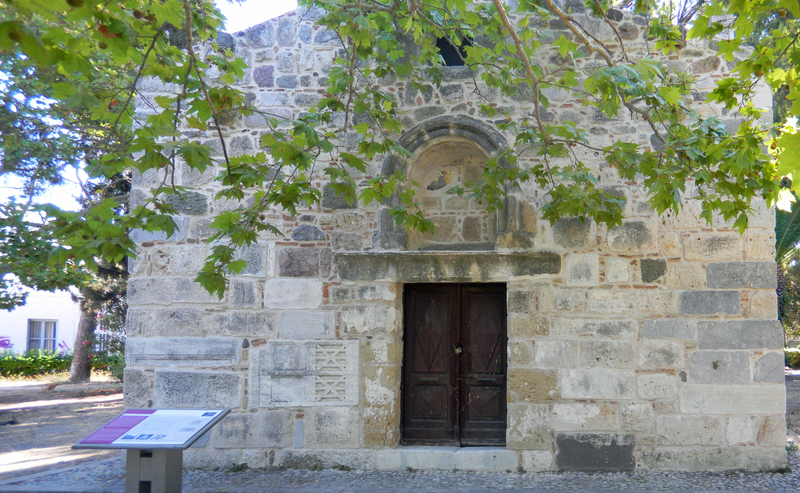 The Church of St. John the Nauclère (Άγιος Ιωάννης ο Ναύκληρος) was built in the early fifteenth century and originally dedicated to St. John the Baptist, the patron saint of the Knights Hospitallers of St. John who ruled the island at that time. The church fell into disrepair and in 1943, it was moved and restored. In 1947, the church was originally dedicated to the martyr of Kos, St. John the Nauclère. John the nauclère (that is to say the owner) had been seduced by the Turks and converted to Islam. Then he abjured Islam and affirmed his Christian faith, he continued to make from jail after being arrested by the Turks: they condemned to death by the stake. 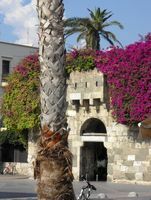 Go to page The history of Kos at the time of the Knights .